Right? I mean they all go together. I remember hearing somewhere that “if it grows together, it goes together,” and I think this list is evidence of that. Marcie’s list was so spot-on this month, I had trouble even narrowing it down to just a few ingredients for my Mystery Dish recipe for October. I ended up with hazelnut macarons as a starting point because I’d just been gifted 2 lovely bags of hazelnut flour by the good folks over at Bob’s Red Mill. I’d been itching to play with it ever since. I’m happy to report that it works beautifully as a replacement for the almond flour in a traditional French macaron recipe. So beautifully in fact, that it may even be better than the original. Especially when paired with squash, cream, and maple. Such a wonderful combo, with a hint of cinnamon. 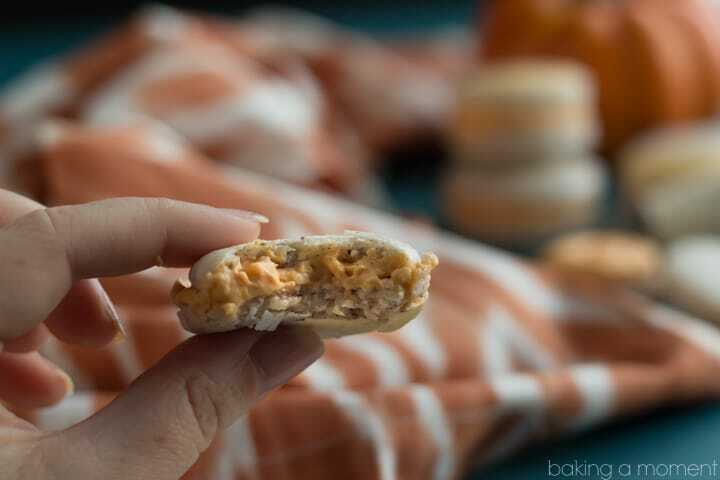 Kabocha squash is a type of pumpkin, so it’s just perfect for this time of year and it works beautifully as an accent to the fluffy cream cheese filling. Measure the hazelnut flour and powdered sugar into the bowl of a food processor. Pulse the mixture to a fine powder, and sift. Re-process any large bits that remain, and sift again. Discard any large bits that still remain. Whip the egg whites, cream of tartar, and salt on medium speed until frothy. Slowly add the granulated sugar (about a teaspoon at a time), while continuing to whip. Once all the sugar has been incorporated, turn the speed up to high and whip until the meringue looks glossy and holds stiff peaks. Dump all the almond flour mixture into the meringue at once. Fold together until the batter falls from the spoon in one long, continuous ribbon. Transfer to a piping bag fitted with a large round tip, and pipe rounds about 1 inch in diameter onto parchment-lined baking sheets. Slam the baking sheet on the counter to force out any large air bubbles, and allow to dry for 30-45 minutes. Preheat the oven to 325 degrees F and bake for 15-16 minutes. Cool completely on the baking sheet, then peel off and sandwich with Pumpkin Maple Cream Cheese Filling. Place the cream cheese, pumpkin, maple syrup in a large mixing bowl and whip until fluffy. Add the cinnamon and food coloring, and mix until combined. Slowly drizzle the cold cream in, with the mixer on medium speed. When all the cream has been incorporated, turn the mixer up to high speed and whip until stiff peaks form (about 30-45 seconds). Be careful not to over-whip the filling or it could get runny. And now for the big reveal! All the fabulous October dishes by all the fabulous Mystery Dish bloggers. You may notice we’ve added a bunch of new members! Please sure to give them lots of love 🙂 And special thanks to Marcie for hosting and organizing! I’ll be back on Friday with a fun giveaway; see you then! Thanks Renee! Isn’t it crazy how much variety you see from the same list of ingredients? I’m always so blown away. So glad you enjoy; thanks so much for the great feedback! These are gorgeous Allie!! I have wanted to make macarons for so long and yet just never have taken the plunge! Love love this flavor combo! I continue to be mesmerized by the all of the gorgeous going on in your treats. 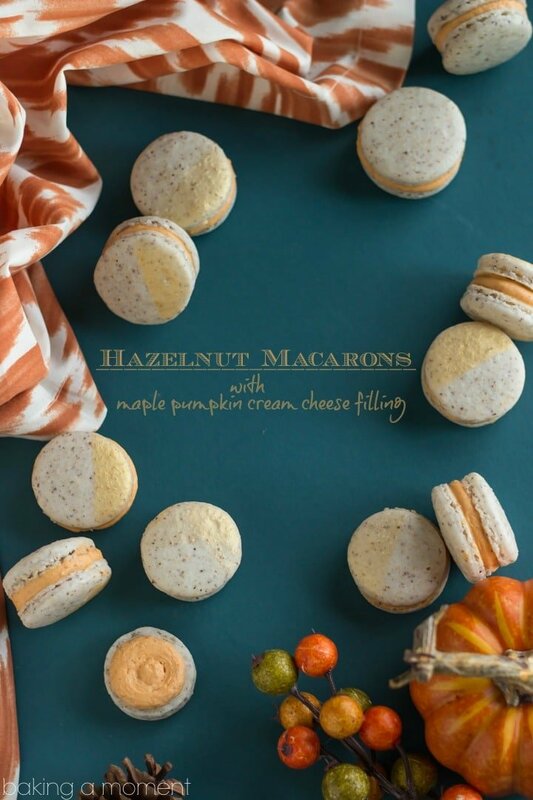 These hazelnuts macarons are truly stunning, so much so, that I don’t know if I could take a bite out of one! 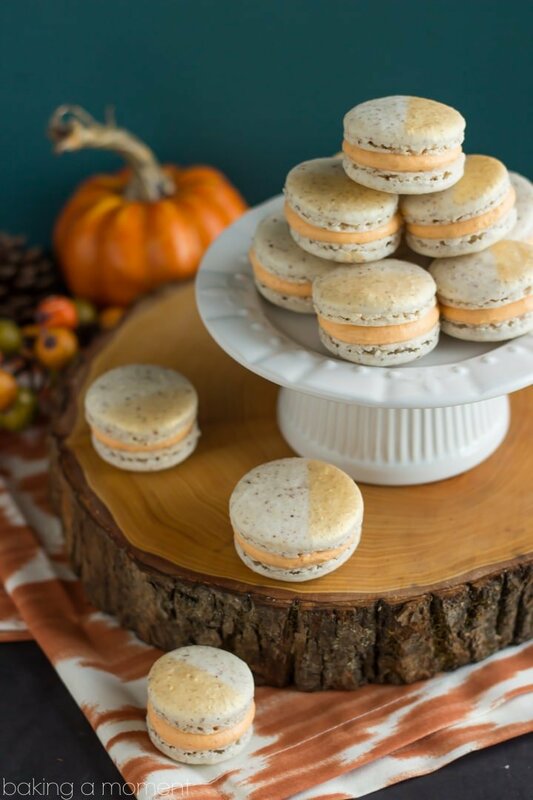 These macaroons and these pictures are just gorgeous! I love the detail with the colored edge on the shells. Just beautiful! Wow! These macarons look amazing! I’ve always had trouble making these (but they are one of my favourite treats), I think its partly because of our warm climate. But seeing these beauties makes me want to give them another go! These macarons look great. I like adding ground or chopped pistachio as well to my macarons. What is hazelnut flour? I followed the link, but it still seemed a bit alien to me. Thank you! Pistachio sounds great! It is ground hazelnuts, just as you suspected! No wheat whatsoever, that’s what makes these naturally gluten-free. 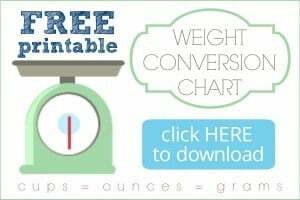 It’s a really great product! This was the first recipe I tried with it, but I’m looking forward to adding it to other things too, like cakes and stuff. Thanks so much for the comment and for the great question! These are the most beautiful macarons I’ve ever seen. Great job, Allie! The hazelnut flour sound incredible and that squash maple filling, I could eat it with a spoon. Gorgeous!! I’ve always been intimidated about making macaroons!! These would be perfect for a party, and think of how impressed everyone would be lol Thanks, Allie! Hope you’re having a great week! These macarons are beautiful Allie! Great way to express your creativity using hazelnut flour, squash and the gold color mist (I must get it now)! I bet these are super delicious! Marcie IS amazing and so are you Allie! So gorgeous and creative – pinned! I love how you combine dall the ingredients, and the photos are gorgeous too. The filling sounds delicious and I love how the macaroons have two different colors. They are beautiful. 🙂 I’m going to look into what they Mystery Dish Blogger thing is all about. Thank you so much Chineka! And have fun looking at all the fabulous Mystery Dishes! I can’t make macarons!! I don’t know what it is, I have failed every time, it KILLS me!! PS I don’t know what happened, I was subscribed to your blog but stopped receiving emails. Tried resubscribing. Reminded me cause I keep seeing your comments on my friend Meggan’s blog!! Oh man that’s terrible! Macarons are so much fun to make. I wish I could give you a lesson! Maybe I need to do a tutorial here. This recipe I’ve been using hasn’t failed me yet. <--now watch I probably just jinxed myself. Anyhow thanks for subscribing Nagi! We are following each other 😉 I love your blog! 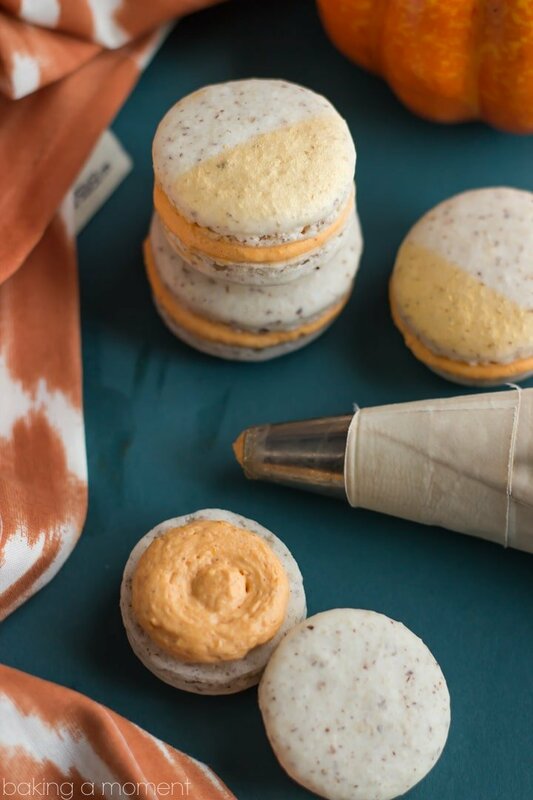 Oh girl, these are some GORGEOUS macarons!!! Love that filling – it sounds amazing. These are too cute, and sound so delicious. Pinned! Hooray! Thank you so much for pinning Rachel! I’m so happy you like them. Have a fun weekend girlie! I loved the hazelnut! I may never go back to almond again 😉 Maybe next time I’ll do a step-by-step tutorial. They look absolutely GORGEOUS! Love the gold dust too – so pretty! Thank you so much, Alessandra! I’m so happy you like them; thanks for stopping by! You are sweet but honestly I owe it all to Culinary Couture. Her recipe is flawless! 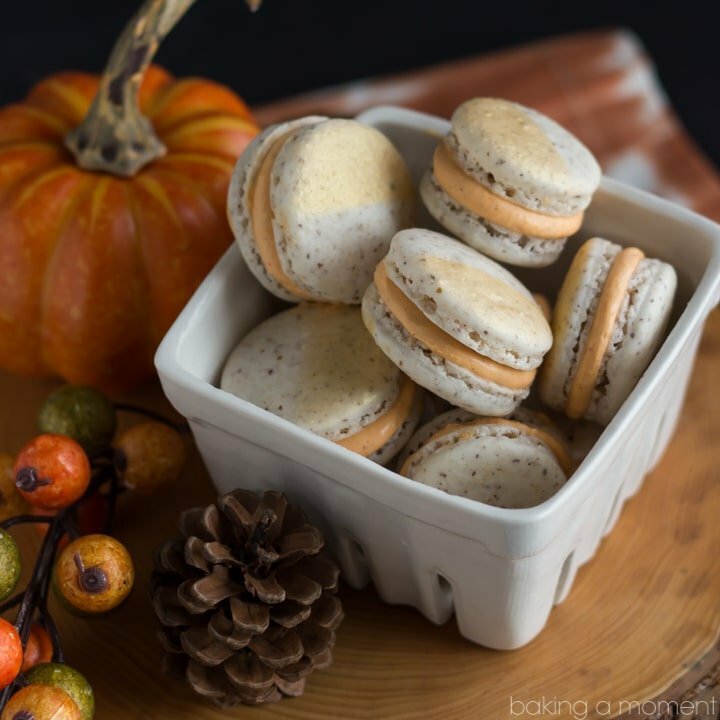 Very cool Mystery Dish ingredients list for this month and LOVE your macarons!!! I want some! 😛 See you soon, love!! Can’t wait can’t wait! Will be so good to see you again!!! You make the best macarons Allie! The gold dust finish is incredible. And that filling! Ugh I could eat that out of a bowl with a spoon. Random, but I love the font combo you used in your photo. All around, an incredible post! Aw thank you Mary Frances! To be honest, I’m so sick of using the same fonts all the time! I need to get some new ones. But I’m so happy you liked this sweetie! Allie, absolutely in LOVE with your macarons! You even put the pretty gold on them… you are so classy in all of your amazing creations! Love, love, love these!